Installing my Penske Traxxion rear shock and ran into a bit of a problem with mounting the reservoir. I assume the bracket is to mount where the passenger peg bracket mounts, but it appears the holes don't line up. Or this is not were this bracket is intended to mount. Even if the holes on the bracket lined up, the bolts aren't long enough to accommodate the extra thickness. It seems like Traxxion would have used the existing OEM reservoir mount to mount the bracket. I'm also not too keen on using hose clamps. I suppose the panniers will hide them, but for the price paid, I was hoping for something more elegant. Does anybody have a picture how they intended for the reservoir mounting? What am I missing? If I remember correctly, the bracket you show gets sandwiched in between the bracket that holds the passenger peg mount. Yes, you need to use the clamps they supply. You can paint them black because they will show. I agree from your photo that those holes don’t line up. Maybe they sent you the wrong mounting kit? 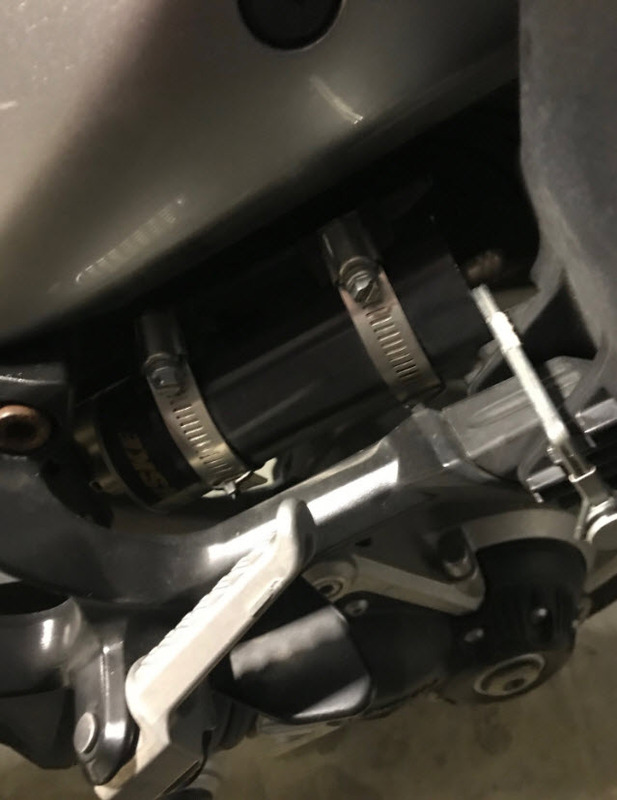 The connection hose on the Penske shock is a wee bit short so don’t follow the OEM route since you need to account for the swing arm travel. If you bought it from Traxxion their customer support is good, so they should be able to send you the correct mount if that is your issue. Hope this helps. Thanks for the reply 4Bikes. Even if the bracket had the correct distance between the holes, the bolts that hold the passenger foot peg bracket on just are not long enough. Without the Traxxion braket, the bolts come even with the subframe of the bike. With the Traxxion bracket I might be able to get one or two threads into the subframe and that is not acceptable. I cobbled (I won't use the term fabricate, since this would insult true fabricators) this bracket out of 3/16" aluminum I had lying around the shop in about an hour. I am no fabricator, and don't claim to be one, so no judging on the craftsmanship. At least I can get it out on the road this week. I will give Traxxion a call on Monday and see what they have to say. Sounds like something I would do. In the end it works, so you should be good. Make sure you email back to Dan at Traxxion and tell him how that bracket doesn't work. We've all had the same issue, and they continue to ship this non-solution with the shock. I told Dan they should either leave it out, or improve it - but this one doesn't work. I copied JDSCO's approach, and wrapped the SS worm-drive included clamps in HeatShrink Tube, and added a backing plate to secure the reservoir to the left side hanger. It's simple, costs virtually nothing, and works. Another thing i have to knock the Penske for, is that the smallish thumb-wheel adjuster knob on the reservoir is difficult to turn with fingers. Once it's mounted in that tucked away position, it becomes more difficult to adjust even with a pair of pliers. Even worse, the pliers will surely make a complete mess of that aluminum knob. Minor gripe, maybe - but for those guys who "set-it and forget it", you wont be bothered at all. Mine fit like a glove, everything aligned just right. It's been probably 5 -6 years since I installed it, don't know what's changed. Fits & looks good. The two hard rubber blocks come with the kit. Here is a photo of my installation and the pinned saddle bag. I don't recall the bracket being an issue, but I do remember those rubber blocks. The line could have been a bit longer to follow the same route as the original shock, but otherwise fits. Which is precisely why I'm asking everyone who has or is going purchase a Penske, to email Dan @ Traxxion and tell him this. Looking at the pictures of the older bikes, it is apparent that some where along the line, kawasaki changed the pillion mounting bracket bolt spacing. Looks like kawasaki also changed the length of the hardware. As you can see from my picture, the bolts are space further apart. Also notice that the front bolt barely comes flush with the frame of the bike. The rear bolt protrudes much more because it is the bolt that came with my canyon cages. Even if Traxxion provided the mount with the correct hole spacing, it still isn't a workable mount because of the hardware. And even then, i'm not thrilled with hose clamps. I'm working on a solution, but it will have to wait until Sunday. on a side note, how do you put the image in the body of the message, instead of attaching it as a separate file? In the details of your photo in the media folder, just copy the "BBC embed code" & paste it into your post. THere's been some really good work-arounds done by the guys here that have switch to Penske's. When I got mine, I emailed Dan to tell him what I thought of the included bracket, and he asked me to send pictures of how we mounted the Reservoir without the bracket. I agree, the hose clamps and bracket are not the prettiest things to look at, but Concours guys typically follow function over form and don't get too bogged down with details. I have to thank Jerry Holland for dropping the coin to put an Ohlins on my son's C14, so I don't have to look at those clamps. If I were to spend that kind of money on a shock, I'm expecting to get perty along with performance. I agree we tend to follow function over form, but we're not talking about a shade tree mod or a $300 shock. The fact that they have had complaints that they ignore just makes it worse. SISF's work wouldn't be very popular if he operated that way. Just sayin. This explains why mine fit so well! (a part supplied from a third party source, i.e. Traxion, doesn't always mean they gave you a good part, or had a good dimension from the start). So, please measure the Center to Center distance of the bolts on your '15 model, both side please, and I'll measure my '08... and post up; and we will know for certain. There ARE 2 different sets of mounts tho, per below, and noted by model years. If you can decode it, it makes sense; so now we know "something" changed, can't say for sure if it was actually that bolt mounting "hole spacing" or not, unless I had the different parts in hand... But I would like to measure them next time I'm near a '10 and '14 and up model..
also... I have found p/n's like those for the Stay's, when they have a suffix with a "letter and number" like xxxxx-xxxx-XYZ are almost always noting a difference in PAINT only, actual "fit" is unchanged... it's a silly Kaw thing; note in the part "decription" one is noted as "F.Black", and the other is noted as "F.S. Black".... kinda like "Flat Black" vs "Flat Satin Black"
it reverts back to the -0472 part number for usage. Mine are 3-3/16" center to center - both sides. The bracket Traxxion sent is 2-3/8 center to center. if you go to the National Rally this summer, find me, and I'll pull my Peg Mount off my bike, and we can try it on yours, and see if the bag sits on it correctly also... only takes 2 minutes, I always carry the tools.. So I'll go back to my original theory, the only difference in the parts, is paint color/finish. Just want to reassure everyone, that I've been in contact with Dan at Traxxion, and he is well aware of this issue, and they are going to be working to build a new mounting option for the Penske Reservoir very soon! He said they'll be looking for someone to "donate" a c14 to the cause in the ATL area, in order to build and test a newer version that will fit the +2012 model brackets. I have no idea how they'll go about doing that.....but if you're interested in having your suspension upgraded, and live near the Atlanta Metro Area, you might want to inquire within. If you bought the shock new ,,,, Just call Traxxion and explain what is going on.. Ask for Dan, He will fix it for sure.. As stated,, there is different brackets,, it could just be a simple mistake. Page created in 0.739 seconds with 25 queries.